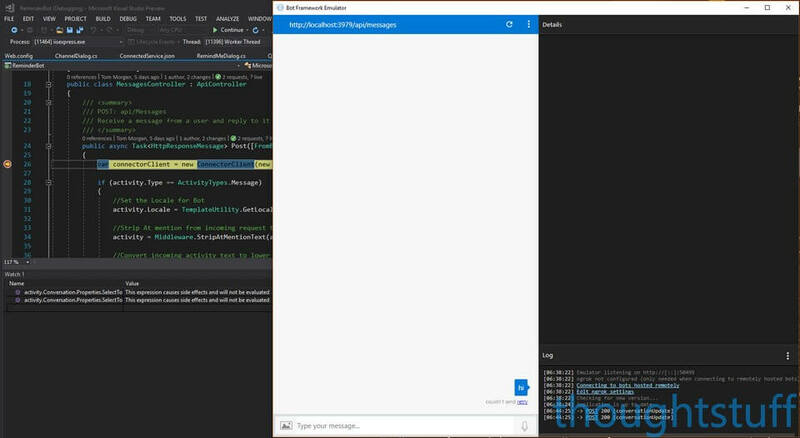 If you’ve done any Teams development, Bot Framework development, or any development that involves writing code that’s ultimately executed elsewhere then you’ll be familiar with the debug problem. The best experience as a developer is to run code locally, where you can add breakpoints, step through it, examine all the variables, and really understand what’s happening. However, despite your best intentions sometimes code runs differently to what you expected once you push it remotely. Once it’s running remotely however you don’t have as much visibility about what’s going on – unless you’ve put in enough logging in the right places (which never happens). For writing apps in Teams there are a number of tools that can help, especially around writing bots. 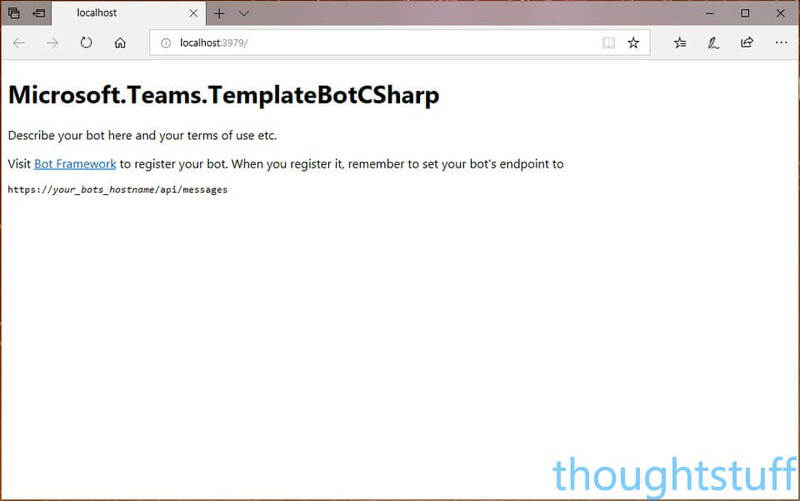 There is a Bot Framework Emulator which allows you to run your code locally but interact with it as though it were deployed into the Bot Framework. It’s free to use, and you can download it from GitHub (if that list of links looks scary, most people running Visual Studio on Windows will want botframework-emulator-Setup-3.5.35.exe). Then, run the emulator and set the endpoint URL to that local address, adding /api/messages. For instance: http://localhost:3979/api/messages. The Emulator is great because it’s really easy to get going with, and gives you an immediate way to validate that your bot code is working OK. However, if you’re writing things like tabs or compose extensions, or responding to Teams-specific behavior (like being added to a channel, being mentioned etc) then you’ll find that the Emulator doesn’t quite give you everything you need. What you really want is to be able to access your bot in the Teams client, but have the code running locally. Luckily, that’s what ngrok can do. 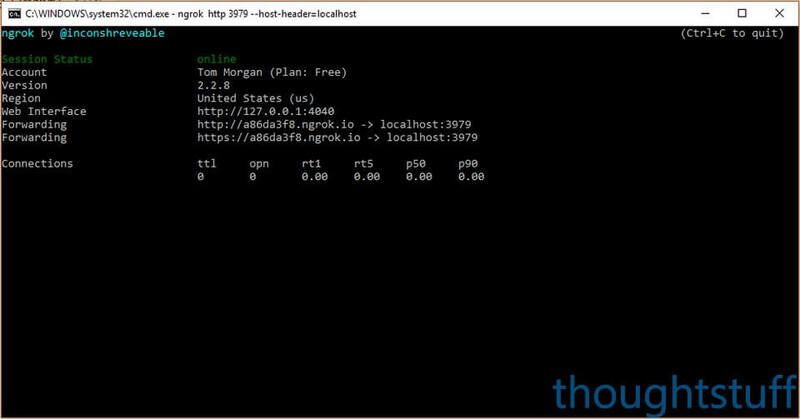 ngrok is a tunnelling service – meaning they provide you with a URL which tunnels all the way back to your machine. It also supports https as well, which is critical to making this work in Bot Framework. You can use ngrok for free, there is also a paid plan which lets you have dedicated URLs. As far as Teams and Bot Framework are concerned, the ngrok URL is “the” URL for your bot/webpage. There’s no difference in the setup. Here’s what you do to set up a Bot Framework bot to use ngrok. I’m going to assume that you’ve already setup and provisioned a bot in Azure. (if you’ve never done this before then there’s a walkthrough here). Firstly, download the ngrok exe and copy it someone on your machine (the same machine you have Visual Studio on). Don’t forget to include the /api/messages on the end. Obviously, you should only be doing this on non-live bots which are in development – otherwise you’re going to get ALL the traffic coming to your local machine! That said though, it’s a really useful way of getting rich information and insight into how stuff performs in Teams, what data you can get from Teams, and how the flow of control and information between Teams, the Bot Framework and your app actually works.